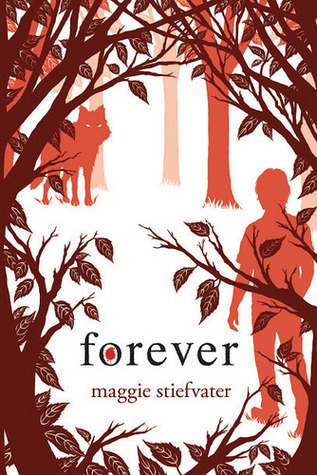 Maggie Stiefvater has this ability to render life after her books meaningless. It truly seems, to me, that her words cast a spell, throw out their tentacles, and wrap around you, holding you down, close, forever, to her world. Stiefvater has mentioned, many times, that she hopes her books are the kind that never truly leave her readers’ minds, and on that front, she has succeeded completely. Whether it be The Scorpio Races or The Raven Boys or even just Shiver, it’s so difficult to fully leave these characters and settings behind and go forward in life. After all, what is grocery shopping in the face of true love? Stiefvater’s Forever is, in my eyes, the best this trilogy has to offer. Although my fingers and toes were crossed tight while reading this – I would have hated to be another disappointed reviewer adding to the throng of mixed emotions – I needn’t have worried. Forever is the perfect ending to this trilogy. Each installment truly built upon the previous story in a remarkable manner and the way everything comes together in this in such a bittersweet and realistic way is heart-stopping. What stands out to me about Forever is its maturity. Whether it be the nature of Grace and Sam’s relationship – all the more intense, romantic, and yet slow – or the developing friendships between Sam and Cole – tentative, understanding, and loyal – these characters have truly grown up. In my eyes, Linger marked a true journey of growth for Cole, but Forever sees him continue to battle his inner demons, especially alongside Isabel. I find that their relationship, though seemingly typical of most, is truthfully very different as Stiefvater never rushes anything between them. Both Cole and Isabel are tortured and broken people; humans who cannot heal merely because of love and affection, but rather with time. And, perfectly, Stiefvater gives them that time and, moreover, she gives us that hope. Additionally, Isabel truly came alive for me in this installment. In Linger, her emotions were raw and edged with a brutality, but in Shiver they are whirling uncontrollably. I was finally able to see the extent of her pain, but also the extent of her strength. Isabel also acts as the voice of reason, which I love. Despite her grief – or perhaps, because of it – she never hesitates to stand up to Cole, Sam, or Grace and put them in their place. As the only human among werewolf friends, her contributions are valuable. Moreover, Isabel, Grace, and Rachel grow to find a steady footing in their friendship. We come to see just how important both these girls are to Grace and, by virtue of their common friend, Isabel and Rachel manage to form a bond, pushing their differences aside. Friendship hasn’t necessarily been a raging theme throughout this series, but with this installment, I truly found that it shone. Cole and Sam, especially, have an intriguing bromance that brews in this novel. With Grace a wolf and Isabel a human, Sam and Cole are stuck together in Beck’s home with nothing but their own company and their swirling thoughts. Thus, the steady trust that develops between them was one of my favorite relationships to watch unfold. Moreover, Cole and Grace share an easy friendship. It is remarkable to see these characters from each others eyes, particularly from those of Cole. Cole sees Grace as a remarkably different person that maybe even we see her and I love those additional insights into her character and particularly into her relationship with Sam. Linger gave us an insight into each character and into their role in the tumultuous plot, and while Forever continues to employ that method, it also manages to build a rhythm of greater balance, throwing in these lenses with which to view the other characters differently as well. It is this, I find, that is the strength of novels with multiple perspectives and Stiefvater truly hones on this. Nevertheless, Forever is Sam’s story. (Admittedly, everything is Sam’s story because, let’s be honest, no one wants to read anything without Sam Roth in it, but this book is more his than the previous ones.) Sam’s growth throughout this novel is remarkable. Not only is he forced to quickly assume responsibilities, being the leader and in charge of ensuring the pack’s safety, but he is also driven to embrace his past fears. Whether it be the bathtub or losing his humanity or even finally facing the truth of his relationship with Beck, Sam bravely faces it all in a heart-wrenching fashion. With Sam, there is always so much emotion involved and my heart tore for him on more than one occasion. I love how Stiefvater has molded his character from Shiver to Forever and looking back on that journey is ultimately both insightful and rewarding. Also, the last page of this book? I was praying it was the last. It was beautiful. I'm a huge fan of ambiguous endings and that one was just...lovely. I'd have hated a more conclusive ending (but I've been told I'm strange since most readers seem to like very wrapped-up endings...*shrug*). Needless to say, I'll be walking around in a haze, now, unable to leave Mercy Falls in spirit. And that is why this trilogy is so remarkable. It takes hold of your heart and doesn’t let it go. It leaves you with hope, but also bittersweet longing. It leaves you shivering, but not forever. It makes you look out upon the world and upon every person you meet in a new and different light. And I love that; those are the books I live for. Honestly I'm more of a Cole/Isabel girl so I think Shiver ended up being my favorite and I'm excited to see that their story will be continued. Still this was a pretty good conclusion to the trilogy and Stiefvater's writing continues to be drop-dead gorgeous! I read this series mid last year and I can't remember much of it at all, sady. However my opinion on the series was rather meh. Werewolves aren't my type of genre. Oh Keertana, I love Maggie! She's one of my most favorite authors ever. I loved her Raven Boys and Scorpio Races and I loved Shiver and Linger too! I never read Forever because I was so scared of it (and still am). A friend of mine spoiled the ending to me and I literally cried when she said it! I still don't know if I should read this. I also heard that there's going to be a novella set after Forever? So maybe if things goes well there, I'll finally have the guts to read this. I can't stand wrapped up endings or happily ever afters either Keertana, so I'm glad to see the ending to this was left ambiguous. I love being able to think of the book days afterwards because of this. I actually saw this book feature on quite a few blogs as best endings to a series today, so I can already tell this book deserves your 5 star rating. Gorgeous review! I am so happy when I see that other people like this series too. It is my absolute paranormal favorite and I agree with you - Forever is the best one. I love Maggie's lyrical style of writing. You have made me bummed. I'm bummed that I haven't continued this trilogy yet. MUST read the whole trilogy! Love the way this one ended and I agree... sometimes an ambiguous ending is so perfect! Oh, Keertana, your review is so beautifully written, and it covers everything I've been feeling about the series since I've finished it two weeks ago. The series conclusion IS ambiguous, but it is the ambiguity that makes the ending so realistic and so perfect for the series. The ending did give us hope, and it truly left me in a state of warmth and peace. You had me utterly convinced I needed to give this series another try Keertana (you're review is absolutely stunning)...until the last paragraph where you mention the ambiguous ending. Uh oh. I don't do well with ambiguous endings at all, I'm that reader that wants everything explained and wrapped up and I want to be told what the future holds for the characters I love. I CAN'T HELP IT! *hangs head* Your last 4 sentences are just beautiful, but I know the ending will bother me. I fail. I love how you talk about Stiefvater's ability to write stories that stick with us. They are the type that get richer and more weighty with age and multiple readings. I don't know how she packs so much into what are sometimes tiny scenes or moments. It's definitely one of the reasons why she's a forever favorite author. I also LOVE this book so much, because we get to see the characters through each others eyes, which you also highlight. She is the master at that. I also love everything you say about these characters' maturity, and especially Cole and Sam's bromance. They really need each other, especially near the end when Sam stops functioning. I definitely need to re-read this one before starting Sinner. You're right we get hope for Isabel and Cole, but Cole especially needs sometime before that can happen. Dying to get the next installment of their story. I have been reading these books since they came out love them. The only thing I wished was that it answered the biggest question the one I believe the the reader wanted. But the adrenaline the story gives you keeps you reading without stopping. Enjoy the good read.